It is the responsibility of insurance companies to assist policyholders with their claims. Their duties include investigating damages, determining if the damages can be covered and paying the correct value for the damaged items or property. However, if an insurance company fails in its responsibilities by violating the duties put forth in its contract, is considered to be acting in bad faith. If you feel that an insurance company isn’t negotiating in good faith, what can you do to address this? Your first attempt to address insurance bad faith can be to write a bad faith demand letter. 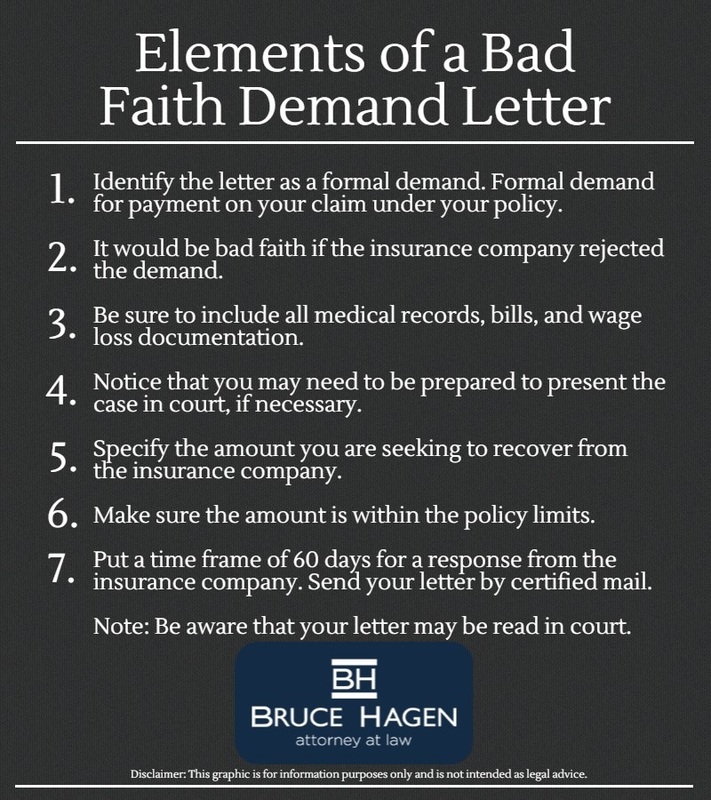 A bad faith demand letter is a formal written call to action to an insurer, explaining the bad faith practices that the insurer has engaged in; for example, improper investigation of, or the refusal to acknowledge, your claim. A bad faith letter is written on behalf of a person, group of people or family that has signed the contract to be insured under a policy for a particular type of insurance, whether it be disability, life, health, earthquake, fire, flood, property, vehicle, homeowner, rental, title, liability, and more. How Do You Write a Bad Faith Demand Letter? Writing a bad faith demand letter is the first step towards resolving your bad faith claim. Since a bad faith letter is written to point out the faults in practice that an insurance company has committed, the letter is most effective when it is detailed, brief and forceful. Your bad faith claim needs to be presented very clearly, with a thorough demand for action by the insurer. Here is an example of the type of style and content that your bad faith letter should have, although more details should be added according to the specifics of your case. Please accept this letter as the claimant’s formal written demand for the available policy limits in this case; i.e., $600,000. We contend that your failure to offer the available policy limits to protect your insured, is an instance of bad faith. Please be advised that we are fully prepared to present the claimant’s case in court. The full $600,000 policy limit will protect both your insured from a larger judgment, as well as your interests. My client will accept $ (X amount of dollars) as the full and final settlement of his/her claim. Please inform our firm of your response to this settlement demand within the next 30 days. Before writing a bad faith demand letter, it is best to speak with an experienced bad faith attorney from the law office of Hagen and Rosskopf, LLC. In addition, our firm can help by doing the following for your case. Conducting an interview with the insured. Conducting interviews with witnesses and others who are involved with your claim. Collecting medical records, reports, and the insurance policy itself or any additional documents that are pertinent to the claim. Exchanging by phone or in person with representatives at the insurance company. Obtaining a just settlement whenever possible, without the need for going to court. You don’t have to put up with an unethical insurance company. If you have experienced bad faith from your insurer, the GA accident lawyers at Bruce A. Hagen can help. Contact us today to get started!